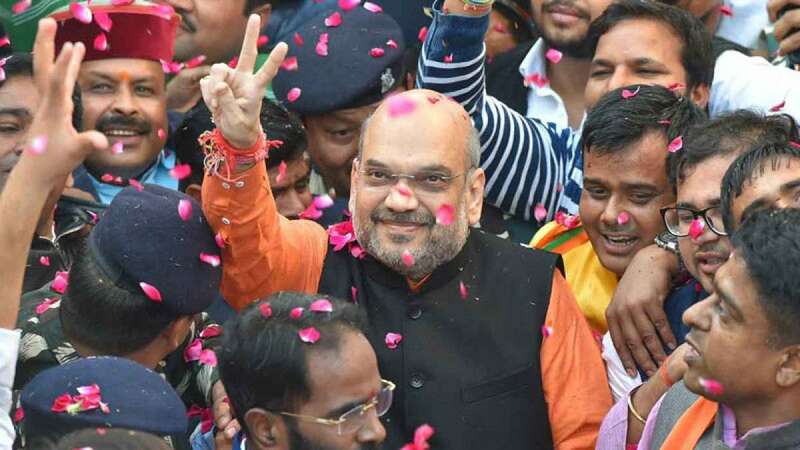 New Delhi : The BJP's win in Gujarat is a victory of "developmental politics" over dynasty and the politics of appeasement, BJP President Amit Shah said on Monday, and attributed the party's lesser number of seats to the "caste-based campaign" of the Congress and its allies. Shah declared that the Bharatiya Janata Party's (BJP) victory in the 2019 Lok Sabha election was "definite". He also pointed out that the BJP, with this victory, was now in power in 14 states in the country, and was a part of coalition government in five other states, bringing the total tally to 19. Asked about the drop in the BJP's number of seats in Gujarat, he blamed it on "caste politics" and the "low level of political discourse". He also said that a meeting would be held to look into the reasons for the reduced seats. "Congress brought the level of the campaign down, because of which our number of seats went down, but our overall performance was good as we got eight per cent more vote share compared to last time," Shah said at a press conference here as the party won both Gujarat and Himachal Pradesh. Later, addressing party workers as he shared the podium with Prime Minister Narendra Modi, Shah accused the Congress of trying to spread the "poison" of casteism. "Congress tried to spread the poison of casteism, brought down the level of discourse, and used derogatory words for the Prime Minister. This victory proves how much confidence people have in Narendra Modi," he said. He said in 2012, the BJP got 47.8 per cent votes, while this time, so far it has got 49.10 per cent vote share, showing an increase of 1.25 per cent. "Since 1990, BJP has never lost any election in Gujarat, and it is going to form the government for the sixth time in the state." Slamming the Congress for "bringing down the level of discourse" during the Gujarat election campaign, he said: "If they (Congress) can learn a lesson from this, 2019 General Elections will hopefully be held in a better atmosphere." Asked about allegations of Electronic Voting Machines (EVM) being manipulated, Shah said: "Can we change the EVMs? It is not something in the hands of the government, it is the Election Commission that handles it." Shah said the "victory march" of the BJP will not stop here, and the party will also win Tripura, Meghalaya, Mizoram and Karnataka in 2018. "We will get a huge victory in 2019 General Elections as well, and in 2022, we will fulfil Modi ji's dream of a new India," Shah said.